mathematicians! Math is everywhere around us and it must be connected to children’s lives. The kitchen is a place that children see everyday and are quite curious about what goes on in the kitchen. Walking into the kitchen with bags of groceries, putting the items away, prepping and cooking a meal, setting the table and cleaning up are inherently mathematical activities. As adults we forget that heavy and light, big and small, shapes, measuring, estimation, sorting, and spatial reasoning are math skills that children are developing. Get comfortable with using math words around children, it helps them begin to understand math concepts. Invite your kids to join you in the kitchen and engage them in conversations that will tap their mathematical mind! 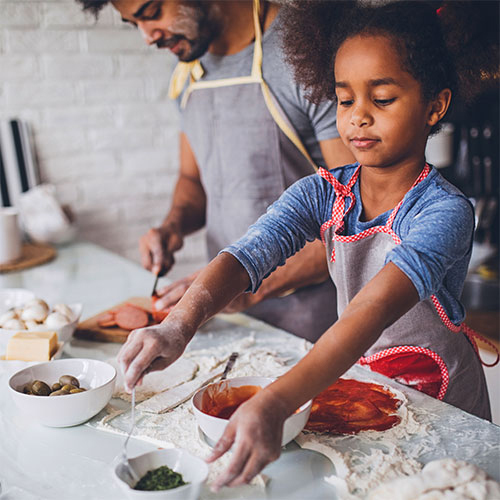 Here are some activities and kitchen questions that can help young children find the math embedded in daily living. Organizing: Putting away groceries builds sorting, weighing and spatial skills. As they help you unload bags, ask children to find the bag that is heaviest and the lightest. For extension of this activity you may even ask them to align and take the bags into the house from lightest to heaviest. The children can then unpack the groceries and separate refrigerator items from shelf items, kitchen items from household items. From there, help them sort items by type in order to place them in the correct locations: fruits and vegetables, beverages, canned goods, etc. Cooking: When prepping to cook, create a numbered list of the items needed to cook. Have your child get the items out and arrange it by order like refrigerated food items, canned items, cooking utensils, seasonings, and pots and pans. This beginning sense of order is of primary importance in math. Show and explain to kids about cups, teaspoons and tablespoons and why and how we use them. Have them tell you the shape of the pots, cutting board and cooking dishes you will be using. Let them help you measure ingredients. Let them pull the right number of eggs out of the carton or fill the measuring cup to the right line. Ask them to stir ingredients 12 times and count with them. Help them set the timer and show them how it counts down. Set the oven to the right temperature and watch as the numbers go up. Talk to them about “degrees and what it means. Let them figure out how many pieces of bread you need to make 4 sandwiches for the family. Have them estimate how many burgers patties can be made with 1 pound of meat or how many pancakes or cookies the batter will make. Place settings: When kids set the table, they activate their counting, spatial and sequencing skills. First they need to figure out the correct number of plates, cups and utensils and then they have to organize these items spatially and sequentially (first the plates, then the cups and then the forks). Their attempts might be messy at first as they scrunch plates together or lay spoons at odd angles! But as they practice you will see their skills grow in great ways. Cleaning: Loading the dishwasher requires complex spatial reasoning- even for adults. How do you getall the dishes to fit? It’s a daily puzzle to be solved. 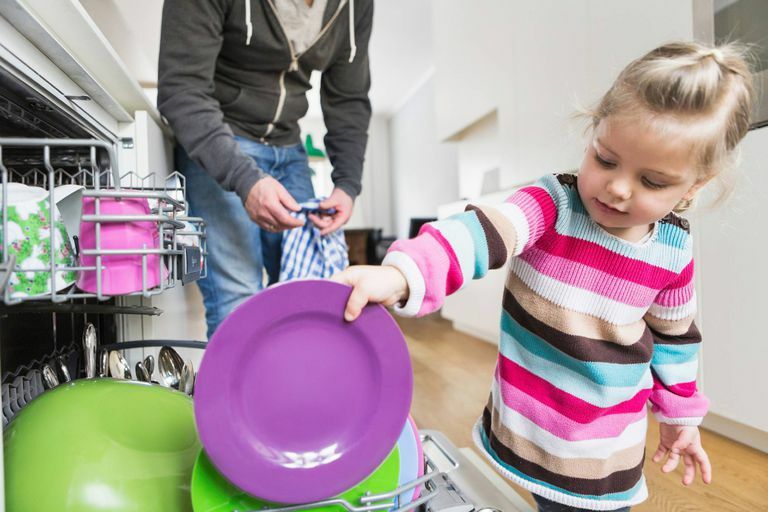 Unloading the dishwasher is a great sorting activity for even very young kids, particularly separating utensils by type. Ask these Kitchen Questions to get little brains working hard! What weighs more, the gallon of milk or the half gallon of orange juice? The 12oz can of beans or the 24oz can of tomatoes? How many waffles do we need to make if everyone in our family eats 2 of them? How can I cut the pizza in half, in quarters, etc. Which cooking pan will make the most amount of cookies? How many cereal puffs do you think you can fit on your spoon at once? Count and make a chart! Do you have more tomatoes or cucumbers in you salad? Count them to find out the results! Which size tupperware would best fit the leftovers? Can you find the lids that match the tupperware and pots? Can you put the mixing bowls or measuring cups back together in the right order? What are the different shapes of the baking dishes, pots, pans, plates, etc? What shapes do you see on your plate? Estimate how many items you think are in the grocery bag? Count them! Parents, help promote the “spirit of mathematics” at home, and if you are in search of a child care that knows the value of interactive learning, contact us today to make the first step!